This is a sketch of one of my Derwent Graphic pencils with a value scale. I have drawn more value scales than I can count. When I first started drawing scales, I used (light to dark) 2H, H, HB, B, 2B, 3B, 4B, 5B and 6B. Now, I just use a 2B mechanical pencil and blend and blend and then I blend some more. This technique was gleaned from reading Lee Hammond’s book Lifelike Drawing. Great book by the way. I highly recommend it to anyone who wants to improve their drawing. Remember those lost in the terrorist attacks on September 11, 2001. 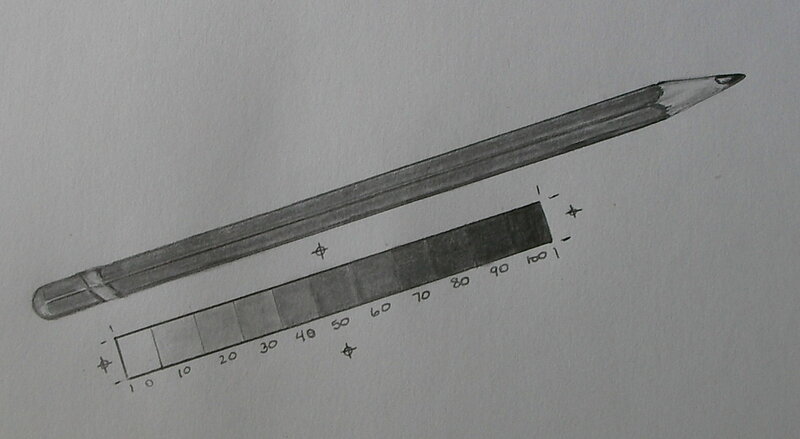 I really like the concept of including the value scale to your drawing of the pencil. It adds a lot of interest to the composition. Well done. Great rendition! You made the plain pencil into something more by adding the value scale. Wish I had thought of that! I am confused as to why one depicts a “pencil” which generally encases graphite but then use charcoal to make the associated value scale – New students need to learn how to manipulate graphite first prior to using charcoal which will be a rewarding experience upon mastering graphite. No need for confusion because the drawing is done entirely in pencil.